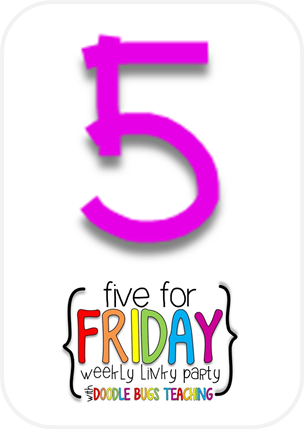 I am linking up with Doodlebugs Teaching for this weeks Five for Friday! It was a crazy fun week, enjoy. On Monday we took a quick trip up to Boston, it made for a fun weekend, New York City on Friday and Boston on Monday (our winter break this year was the Friday and Monday). 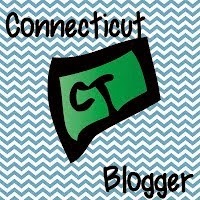 One of the great thing about CT is either city is a day trip and they are both so different and fun! 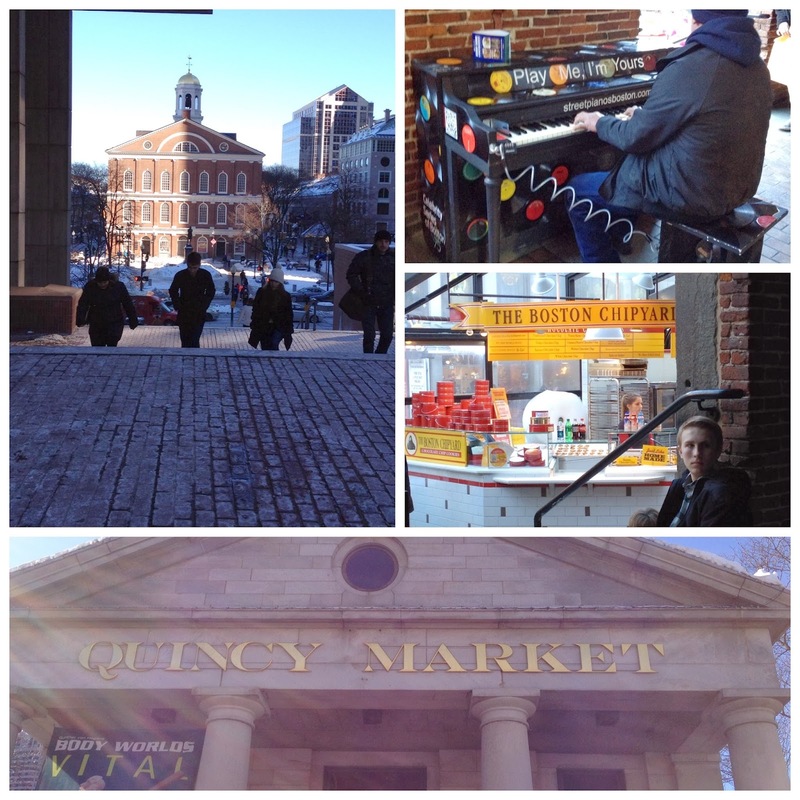 We took it easy and went to Quincy Market for lunch. In the area with tables to eat we saw the piano in the picture above, I thought it was neat how the records were all over it. Unfortunately anyone can play it, at any time, and the gentlemen who decided to play it wasn't good, and he sang loudly. I can tell you tables cleared quickly! Also, for the first time I noticed through the doorway the little spot that sold cookies called The Boston Chipyard, for some reason I thought the name was great so I took a picture. Our main attraction for the day was the Aquarium, it was my first time at the Boston Aquarium. Normally when we go we wander the streets and see what happens. I love to follow the red line :) However, like in most the country it was freezing and snowy, so we decided to do something indoors. 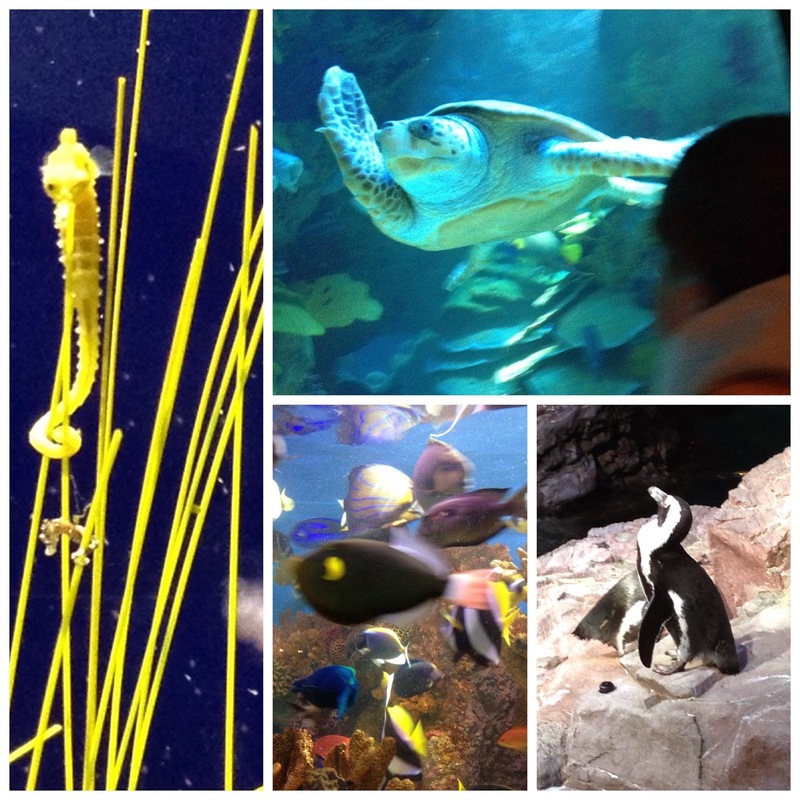 I loved all the penguins and the fish, but my favorite were the sea turtles! Of course after seeing all the fish we walked next door to Legal Seafood for dinner. The waitress even carded me at 32! She looked at my age and said "Oh my, I never would have guessed that"
Well on Tuesday we had our 7th snow day! I am done with snow days. I received my first Erin Condren product in the mail on Saturday and I promised my grade partner I would open it with her. On the way to Boston, we were texting, and she said I can open it without her because it was killing me. So with no school I opened it, and I love it. Right now it is on my shelf waiting patiently for next summer when I start planning for next year. It was on sale for loving teachers so I grabbed it now since I was planning on buying over the summer. 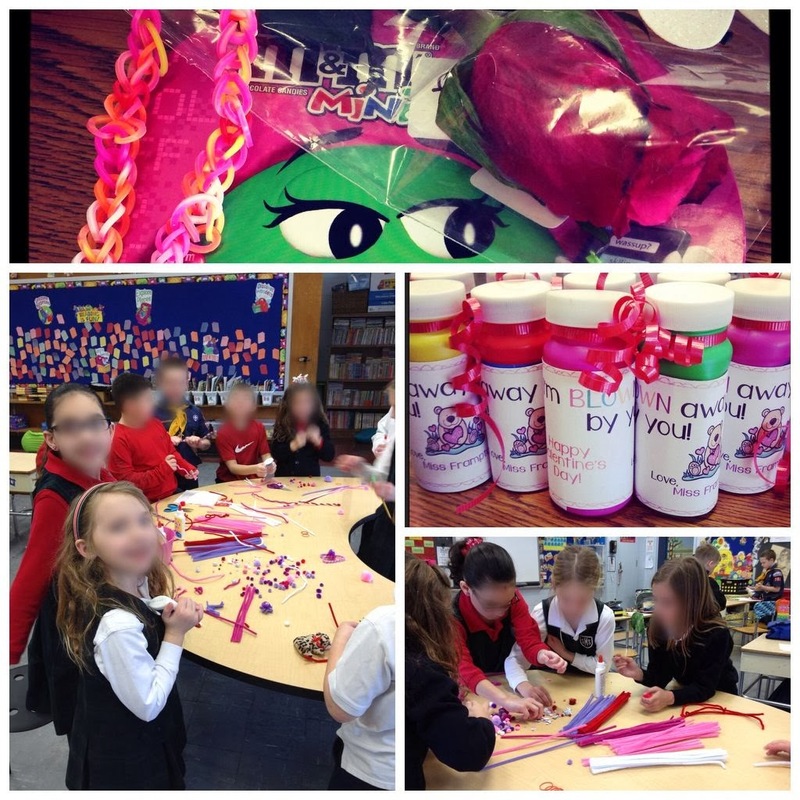 We finally had school Wednesday so we celebrate Valentine's Day. I received jewelry, a rose, and candy from my students, what more can a girl ask for? I also purchased a "craft" from JoAnn's Fabrics, it was simply a bag with pipe cleaners, goggly eyes, and pom poms. I dumped the bag on the table and let them go at it after we exchanged cards, and they went nuts! 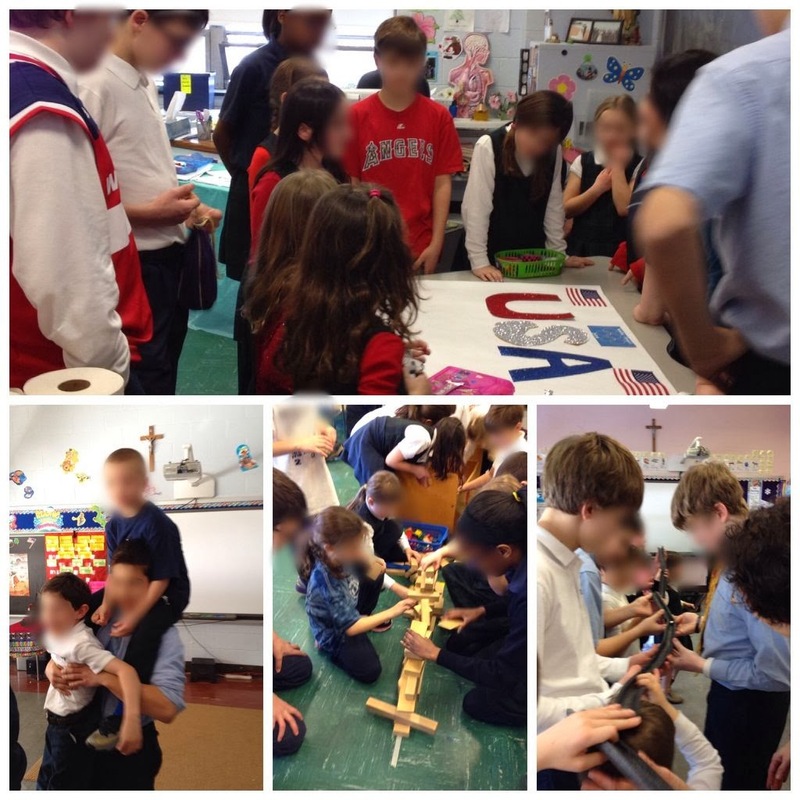 They created all sorts of things until lunch, and continued through indoor recess, they only stopped because they used it all. I was really impressed with the detail and creativity that my students showed, both the girls and boys were throughly engaged, with no directions except GO! 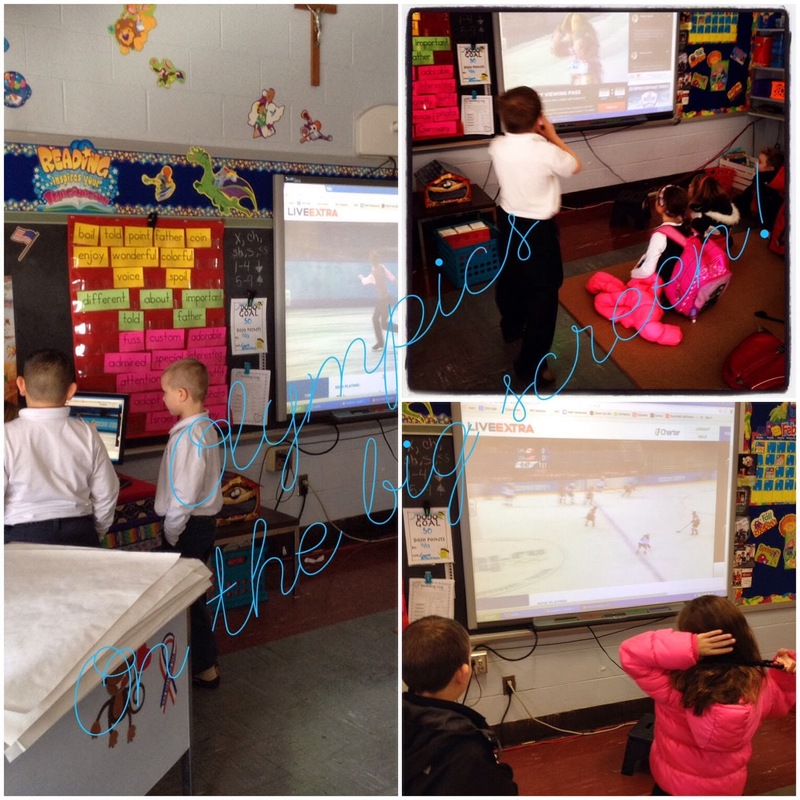 We also started our school wide Olympics on Wednesday, so all afternoon was that. But, we did manage to get some daily 5 in, and candy heart graphing done. We have officially started our school Olympics! So far the kids and teachers are having a blast. On Wednesday I gave each team a large piece of paper and they had to create a team banner. Above you can see team USA working on theirs. They are now all hanging in our gym along with posters our 8th graders made to represent all the sports in the Winter Olympics. On Thursday, we had the games part of the Olympics. 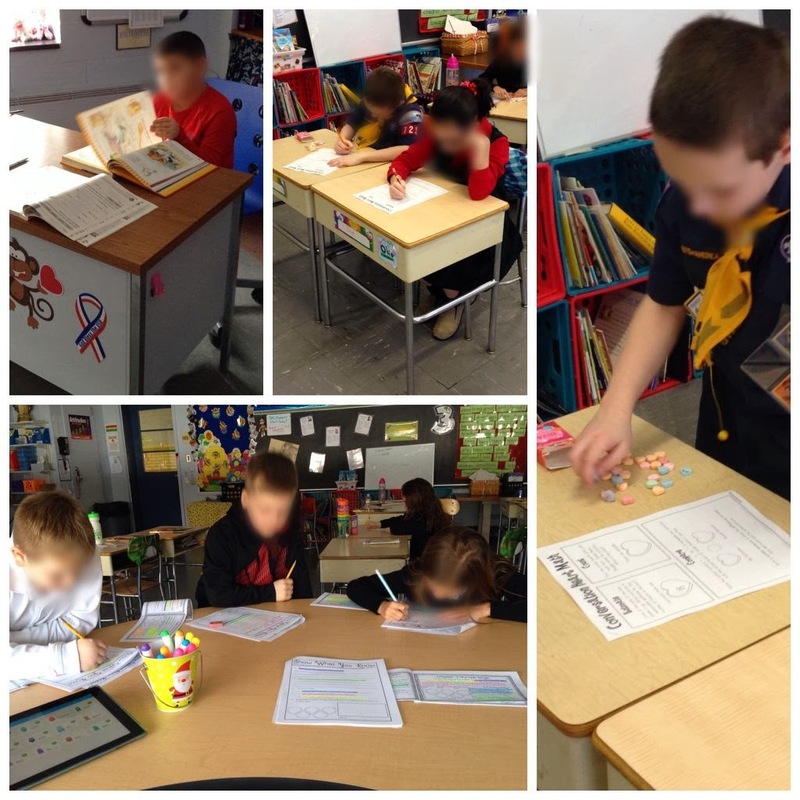 Each team filtered through 7 activities in different rooms, in each room they competed with another team. I have some pictured above. In the first picture the whole team (18 pre-k-8th grade students) had to fit in the square taped on the floor. They found it easier to pick the younger kids up. In the middle picture the 2 teams have to build a block tower, the tallest block tower at the time of the buzzer won. I also have a picture of the marble run. In that one they had to have the marble run across the room using the pieces of foam pipe. I wish I had a picture of the speed skating, it was adorable, they had to slide across the room and back with a piece of polar fleece under each foot. We have 2 more events next week. I do miss not having a team because I am trying to make sure it runs smoothly, but it is fun being able to see all the teams have fun. 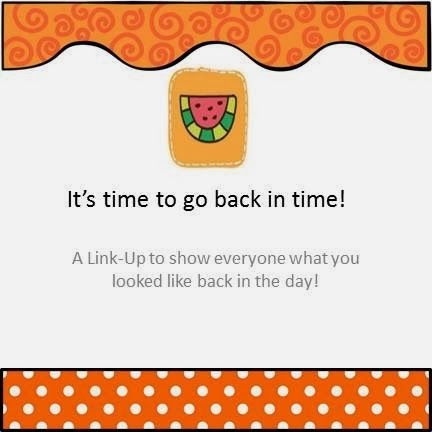 Thank you to Susan at Happiness is Watermelon Shaped in 3rd Grade for this Back in Time linky. When I saw it I immediately knew I wanted to share with you what I looked like in 2nd grade, so here goes. 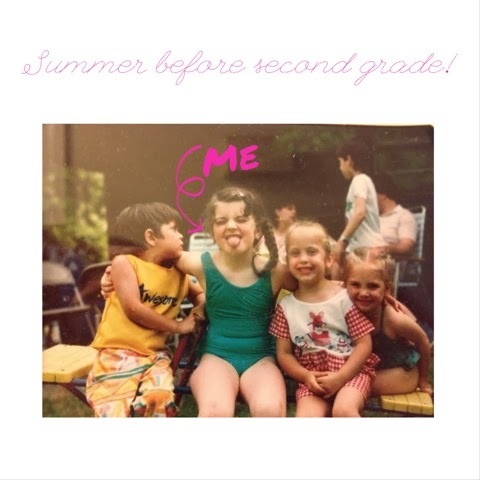 This first picture is of me during the summer before 2nd grade. I am sitting on the see-saw with some of my cousins. Of course, I am the one sticking my tongue out! It was an interesting summer that year, we moved across town, my first ever move and I was devastated. We moved from the Sandy Hook section of Newtown to just the Newtown part of Newtown. I loved my new house and all the kids in the neighborhood, but it meant I had to leave St. Rose and go to Middle Gate. I remember going to school and crying every day, by October my parents had me back in St. Rose. I guess I was destined to be in a catholic school. 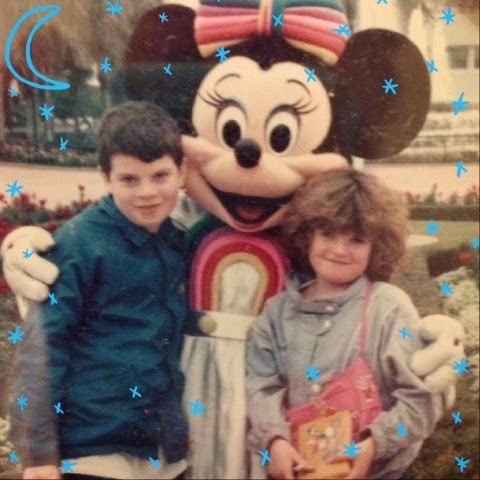 This next picture is from Disney World in December of 2nd grade, I can tell because somewhere between that first picture and here I was permed. 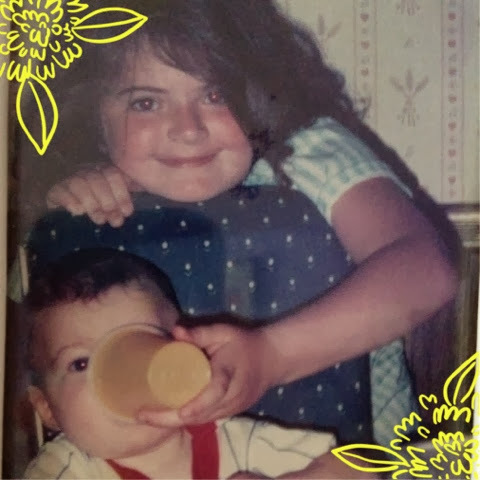 Yes, it was the 80's and my aunt was a hair dresser, so I was permed. She did it right in the kitchen sink. I don't remember why I was permed, I never was one for fashion and I am still not. In fact today my hair is in a pony tail, I like to keep it simple. I think the perm came from my love of Shirley Temple, or my Mom, not sure which. 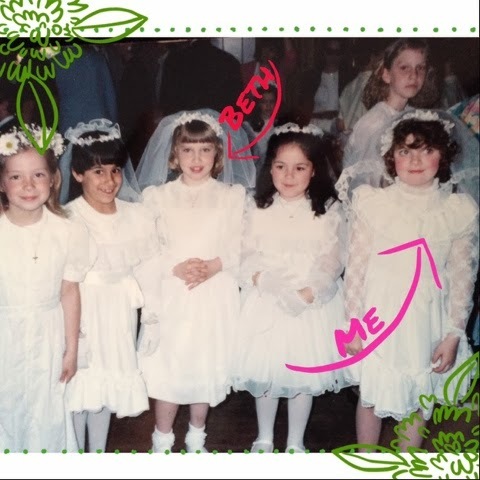 Fast forward to May and here I am receiving my First Communion. My best friend Beth is also tagged in this picture, in fact I texted her yesterday to see if she had one because I couldn't find one. I wanted to include a picture from this day because it is so much apart of what I teach in 2nd grade. I think the kids will get a kick out of seeing me dressed up for the special day. Notice I still have that perm. This final picture is from 3rd grade, I included it for two reasons. The first is notice that the perm is gone, and that is pretty much my hair now, except you will see it in a ponytail. 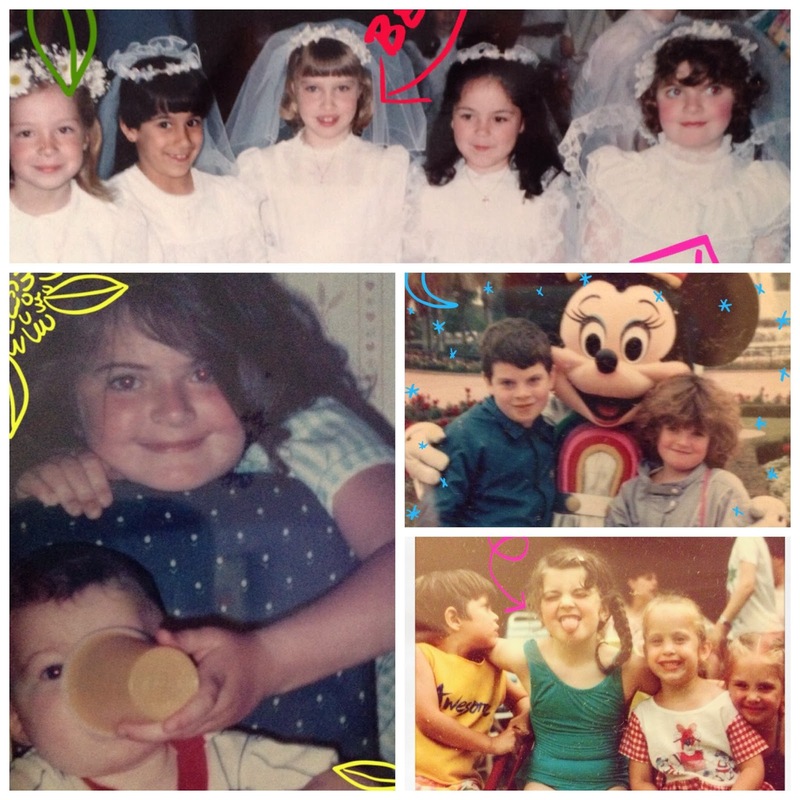 The second is that the picture from Disney had my older brother in it, but my younger brother wasn't born yet. He is a big part of my childhood and was born when I was in 3rd grade, so I thought I should include him as well. Overall I have fond memories of my year in second grade, and of grammar school as a whole. 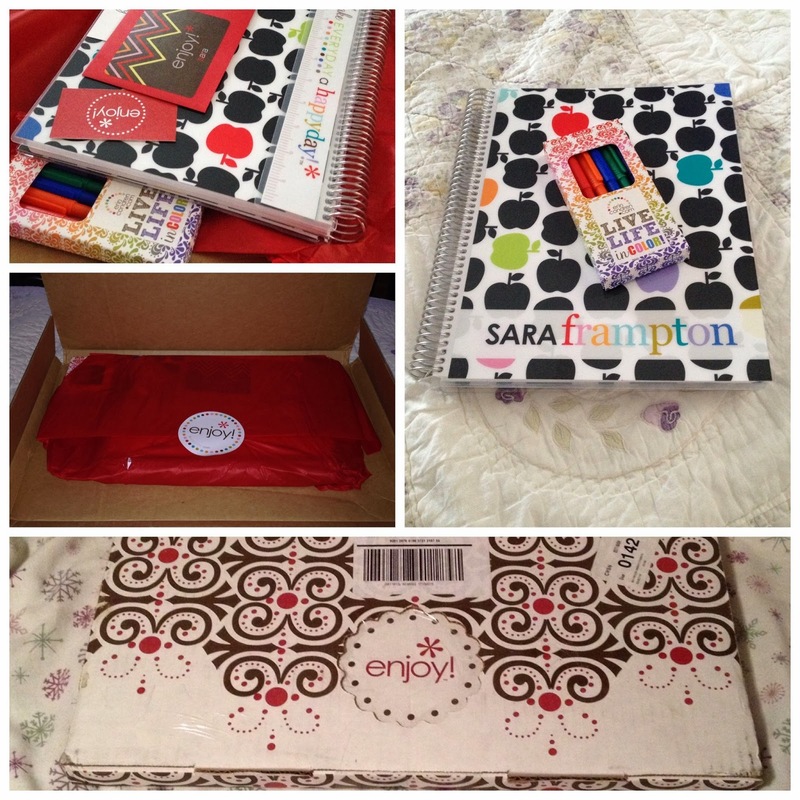 I hope I am giving my students memories to look back on and cherish. 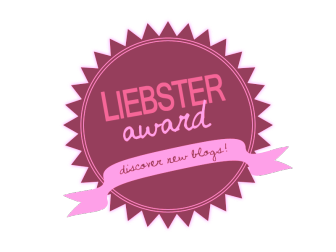 If you would like to share in this link just click the image below to get to the page where it all started. 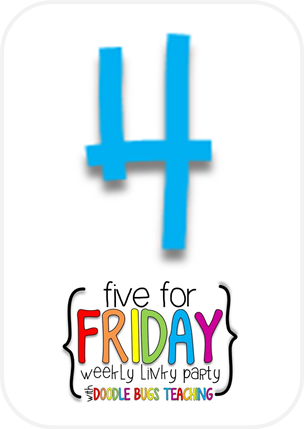 Five For Friday- Go USA!!!! 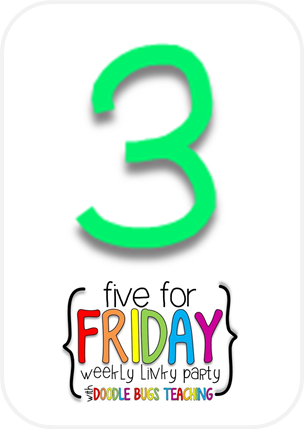 Its time to link up with Doodlebug Teaching for Five Random things from my week. The Olympic Spirit it really showing in my room. We have been doing everything Olympics. We have been reading Scholastic News based on the Olympics. 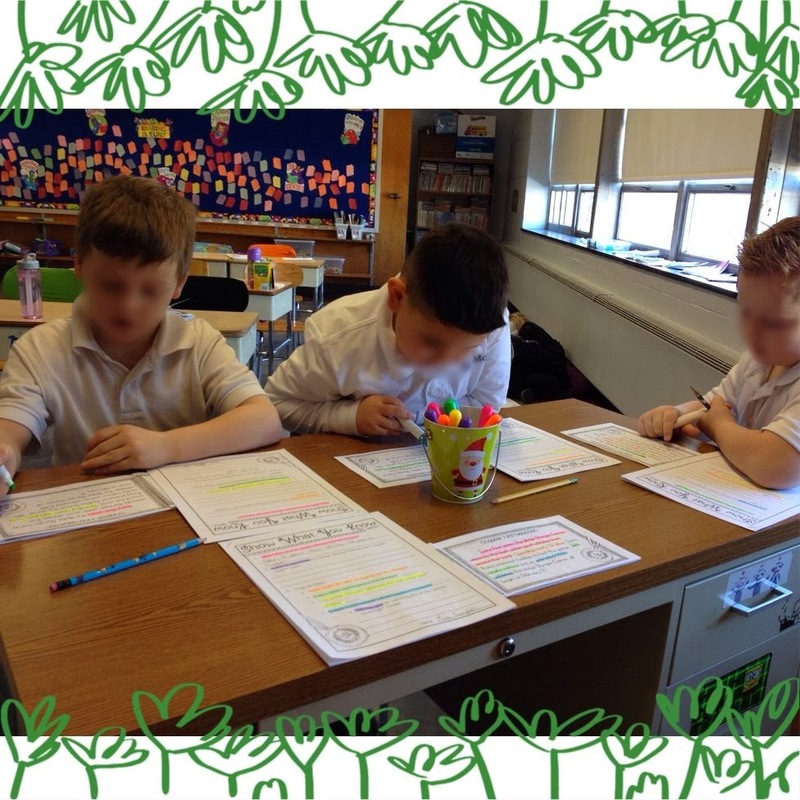 Discussing the events we have watched at home, and what we think will happen next. 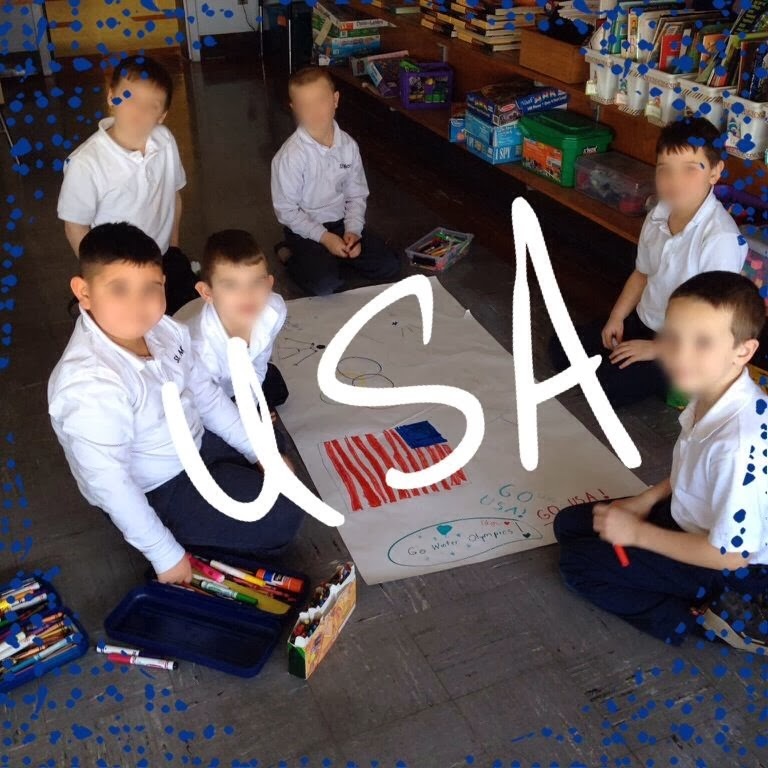 I had a group of boys make an impromptu poster during recess to support team USA. We are working on a great Olympic comprehension book called Sliding into the Winter Games, from Creekside Teacher Tales on Teachers Pay Teachers. 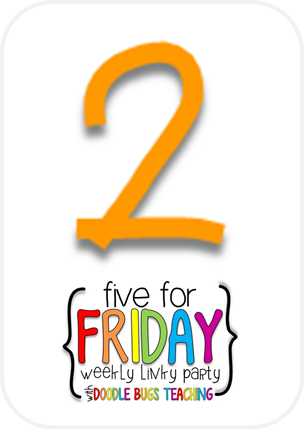 I have been showing events on the Smartboard during lunch and dismissal. Do any of you have students who prefer to watch on the computer screen instead of the Smartboard? 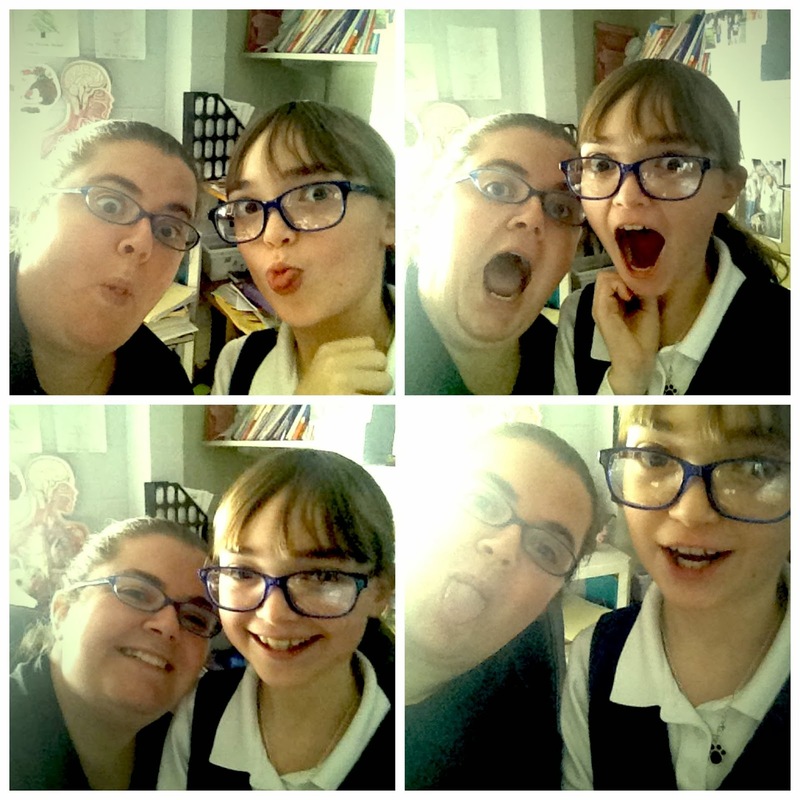 I can't wait until next week when our school wide Olympic Games starts, I am the main organizer of this so I have been going a bit crazy with Olympics. 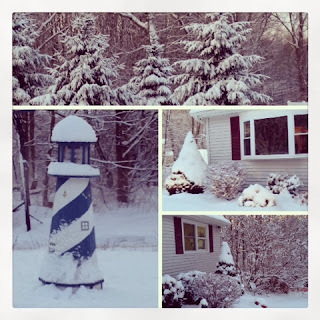 Our weather here has been crazy and snowy, more delays and snow days. Ok its New England it is expected, but I still have to share. 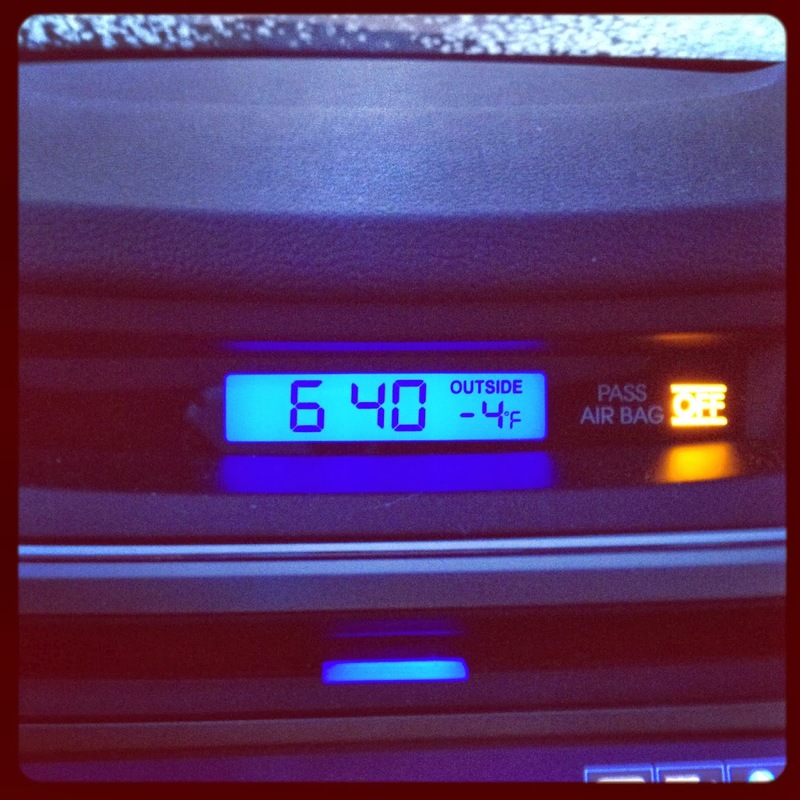 Monday it was almost above freezing and my car was gross from all the salt and sand from previous storms. 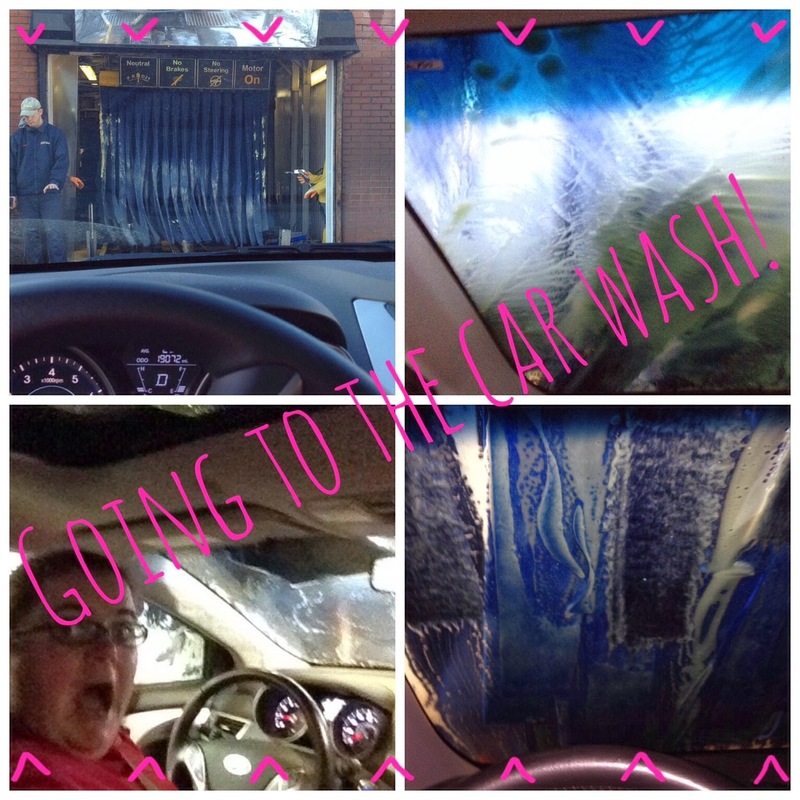 So we went to the car wash! The next morning it was -4, brrrrr! I am having my own mini classroom makeover, and my class is so excited. I asked my principal for a kidney table and he said yes! We were squished trying to meet around my little desk, so this is going to be great. It was supposed to be delivered last week, but the snow delayed it. I finally got it on Wednesday, but forgot to take a picture. 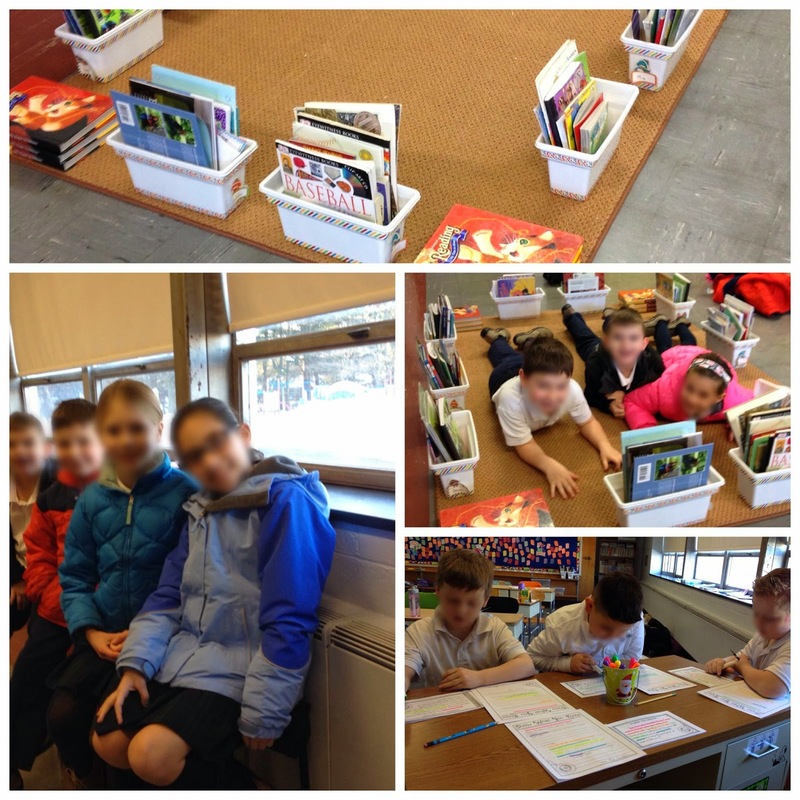 I did get new stools from Ikea that the students are sitting on in the above picture. My little desk is in the picture as well. I also caved and went to Lowes and purchased a rug. They have 5x7 rugs for $25, so needless to say for that price I did not care that it was brown. However it was wrinkled from being rolled so I put books and book bins on it to flatten it. Some of my friends were so excited when they came in they jumped over the bins and books and had to test out the carpet. All day that sat in the middle of the bins to be on the new carpet, I think its safe to say they like it. 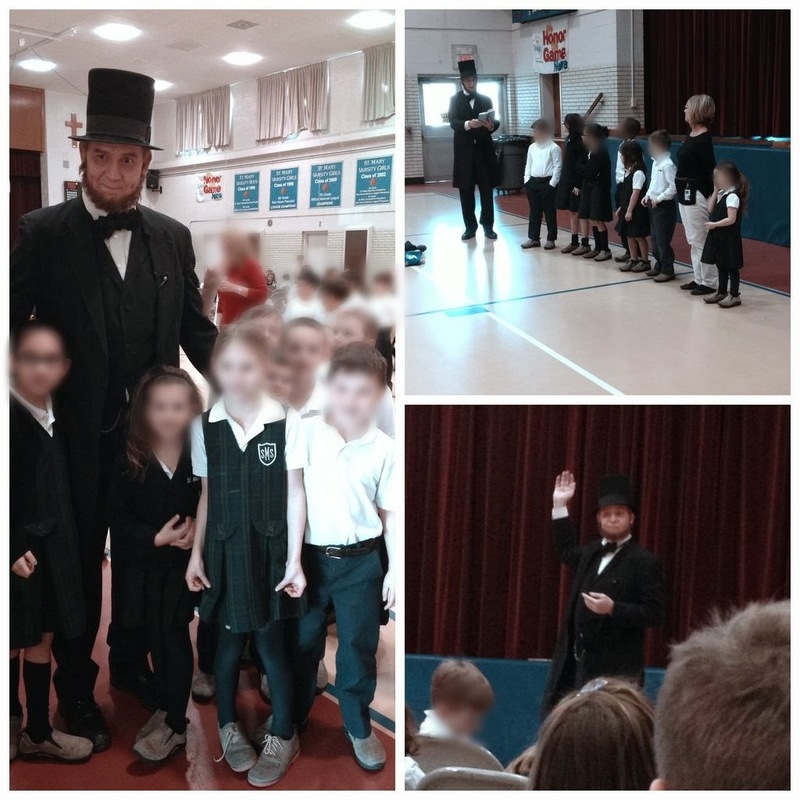 President Lincoln came to our school, on his birthday! How lucky are we that the president came to visit us. It was a good presentation, this company does a good job with their presentation. The Lincoln actor was very good at bringing the history to a level that didn't go over their heads. They really enjoy when the presenters come to school. Well they usually like when they come, every once in a while you get a dud. All I have to say for number 5 is that one should not leave their phone unattended unless they want it full of selfies. I could only do this with this student because I am friends with her mom, and the teacher's phone we did this to is friend with the family as well. I also got permission to post it. So here is the glimpse into my week, I hope you enjoyed it. 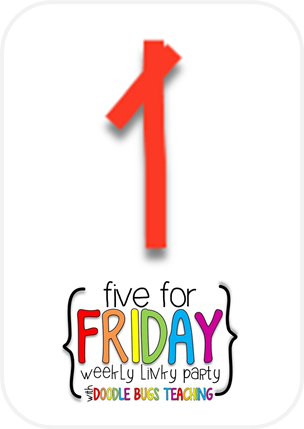 Come back next week to see how we handle Valentine's day on Tuesday, and the start of the school wide Olympics. I will also have a photo with my new table in it. 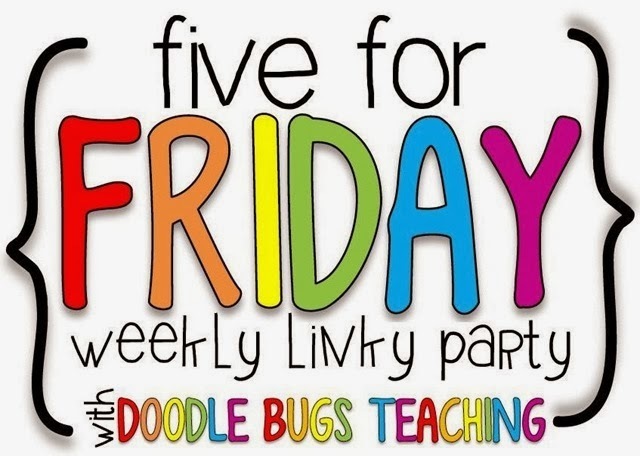 Today, I know a day late, I am linking up with Doodle Bugs Teaching with Five For Friday. I had all intentions of doing this yesterday, and then Opening Ceremonies happened. My randomness from the week is quite random this week. We had 2 snow days, 2 snow delays, and a half day. Needless to say we didn't get much accomplished outside the required elements this week. I know I am preaching to the choir when I say this, but a week without routine is the most exhausting, even with 2 days off. 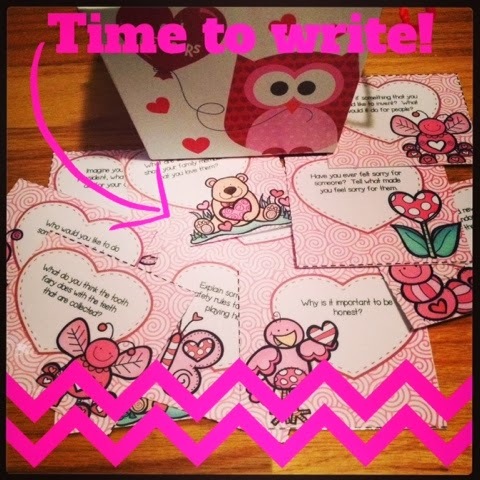 To start my "week" I put together my new writing prompts for February, I almost forgot with all the Super Bowl excitement, not the game but the party ;) My students were particularly excited with this months selection because I added a stuffed monkey to the basket to be their writing buddy. Now they want to write just to have the monkey with them. I am starting to think each month will have a new stuffed toy to keep up the excitement! Well it looked like I rushed to get the writing together for nothing, because Monday we had a snow day. I did get a jump on next week and printed, laminated, and cut out the fluency cards I am starting next week. I will post more about them as we use them. We got to school on Tuesday, but I din't get any pictures :( On Wednesday we had another snow day. 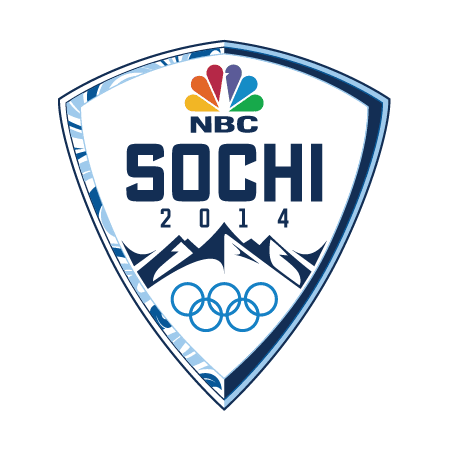 I am coordinating Winter Olympic activities for some school wide events so I worked on that most of the day. 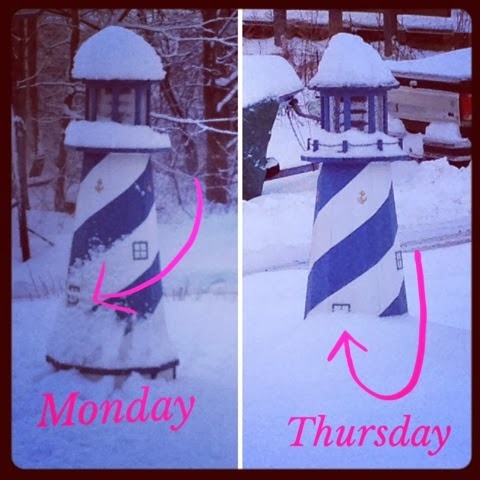 When I left for school on Thursday, at the delayed opening time, I grabbed this comparison picture. 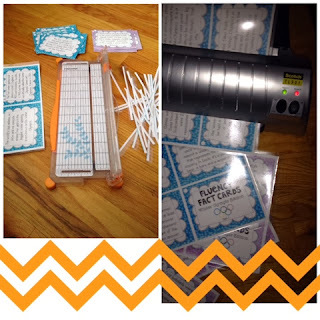 Stop the presses, are these fun engaging academic activities going on in the classroom? Yes, we did get a few read the rooms in the week, with the limited school schedule. 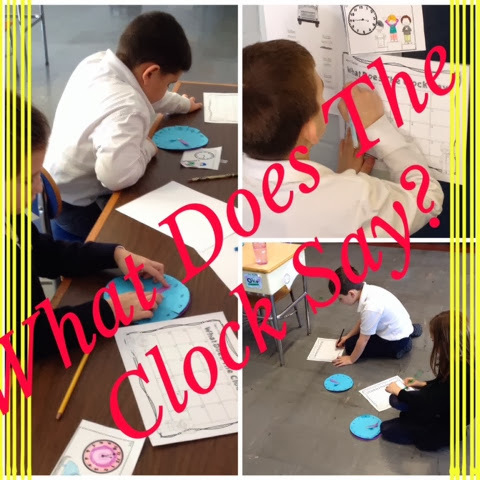 The favorite of the week was made by my grade partner, they loved reading the clocks around the room. I made a nice clock that they could take with them to "help" the minutes are under the hour. 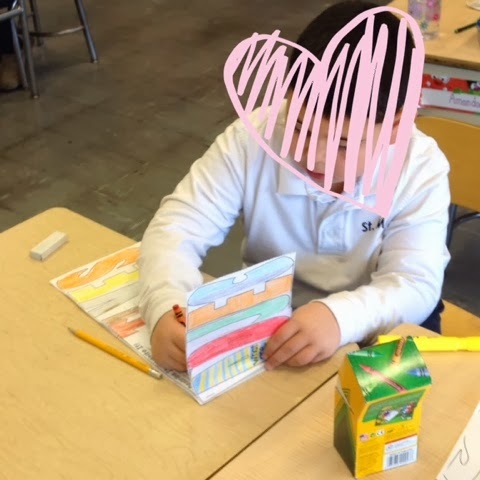 We also started an adjective flip book, it was all supposed to be done this week, now its a two week project.